Climate scientist Noah Diffenbaugh of Stanford University and colleagues used a novel combination of computer simulations and statistical techniques to show that a persistent region of high atmospheric pressure over the Pacific Ocean–one that diverted storms away from California–was much more likely to form in the presence of modern greenhouse gas concentrations. We know, of course, that global warming is making heat waves longer and stronger and more frequent, which in turn makes droughts worse everywhere. But climate change is also causing reduced precipitation in many regions, such as the Mediterranean and southwestern United States. This double whammy from carbon pollution means we’ll be seeing more and more dangerous record droughts. Scientists agree that the immediate cause of the drought is a particularly tenacious “blocking ridge” over the northeastern Pacific — popularly known as the Ridiculously Resilient Ridge, or “Triple R” — that prevented winter storms from reaching California during the 2013 and 2014 rainy seasons. Finally, researchers looked at two sets of models — one set that duplicated the current climate, in which carbon pollution is warming the atmosphere, and the other set in which carbon pollution levels were comparable to those just before the Industrial Revolution. The researchers found that the extreme heights of the Triple R in 2013 were at least three times as likely to occur in the present climate as in the preindustrial climate. They also found that such extreme values are consistently tied to unusually low precipitation in California, and to the formation of atmospheric ridges over the northeastern Pacific. Indeed, as I’ve reported, scientists a decade ago not only predicted the loss of Arctic ice would dry out California, they also precisely predicted the specific, unprecedented change in the jet stream that has in fact caused the unprecedented nature of the California drought. 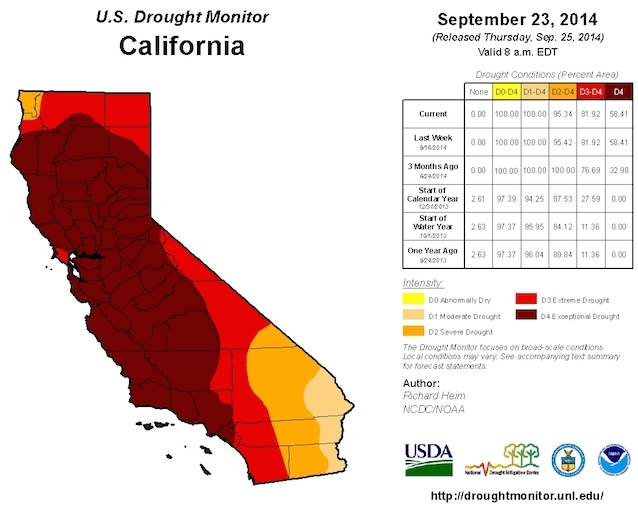 Bottom Line: Human activity has made droughts longer and stronger in many places, including California. If we continue on our current path of unrestricted carbon pollution, we will be sharply increasing the chances of civilization-threatening mega-droughts here and abroad.